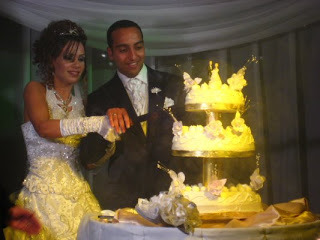 For those of you who can’t get enough of weddings, the latest wedding I attended was that of Mokhtar and Samira. This time, I actually knew the couple getting married, as opposed to gatecrashing or being brought along as wedding arm candy. The format for an Egyptian hotel wedding (as opposed to raucous street weddings) goes as such: couple sit on a raised platform while the guests are each photographed with them, then each guest drinks thick, sweet sherbaat, sort of like raspberry cordial without the water. Sugar-fuelled, the dancing begins. 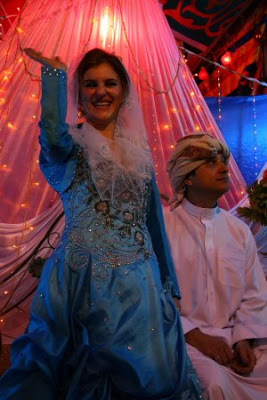 Firstly, as with western weddings, the newlyweds take to the dance floor. Samira wore a beautiful gown, the bodice heavily encrusted with sequins and the skirt trailing across the dance floor through a cloud of billowing smoke. Then couples join them on the floor, and finally, everyone else get up to dance them into their new life, sometimes surrounding the couple , clapping, or taking turns to dance with either the bride or groom. The boys were feeling energetic, so they tossed Mokhtar in the air, for good measure while his sisters danced around Samira, kneeling like handmaidens to a princess. 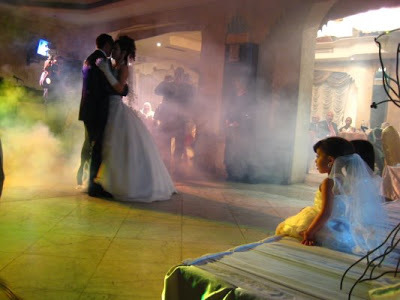 There are many differences – most Egyptian weddings are dry occasions, dominated by a DJ who, despite being perhaps 25, is conveniently deaf to any requests to turn down the volume and the reverb, and there are no speeches. The paperwork has been done earlier, so there’s no officialdom, thought there was a point when the bride and groom changed each others’ rings from the right hand to the left. The similarities include the big white dress and there’s also the big white cake. There’s also the faintly rugbyesque scrum for the bride’s bouquet (taken out neatly by a girl I thought was married) and a bevy of pretty little girls in baby versions of a wedding gown. They chose not to have a bellydancer (I was ok with that, see earlier posts of plumpy Russian strawberry blondes in pink body stockings). Just before it was cut, I drifted over to take a look at the cake, to find the three-tiered affair rising UP THROUGH THE TABLE in a puff of smoke, like a genie emerging from the bottle. Nobody else seemed to notice… Samira and Mokhtar glided over to cut the cake, feeding each other mouthfuls of the creamy affair that would later feature on the dessert buffet, and at midnight, disappeared to their penthouse room overlooking Cairo before travelling to the seaside resort town of Hurghada for a week-long honeymoon. Mabrook (congratulations), Mokhtar and Samira. I realise I haven’t written much – if anything – about my new place, and the point of this blog was to get a bit up close and personal, unlike my newspaper articles. So: I now live in Heliopolis, as the foreigners call it. 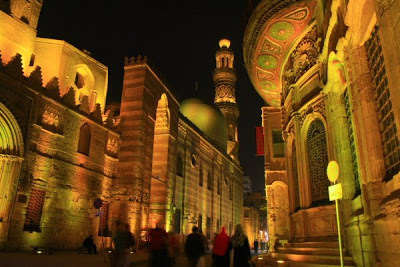 The locals call it Misr el Gedida, or New Egypt. The ancient Greeks, if they read the name, would have translated it as ‘Sun City’. I saw some photos from the turn of the century, and this area wasn’t much more than fields. Then – and I admit freely to paraphrasing liberally from my Lonely Planet amongst other sources – a cashed-up Belgian industrialist, Edouard Louis Joseph, Baron Empain, built his desert city 10km from Cairo in the early 1910s. It was a planned city, though walking around it today, you could dispute that, judging by the amount of times you’ll get lost and the inaccuracy of the maps. But then, hey, people get lost in Canberra, too. There are some notable landmarks here, the most striking being the Baron’s palace. 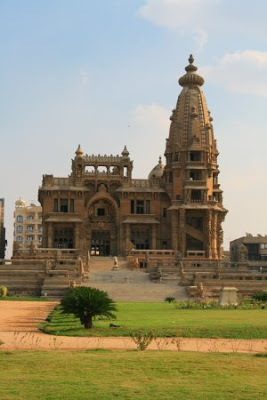 He went all Asian and had built a Hindu palace (see the pic) by French architect Alexander Marcel. It is visible when you drive to and from the airport. So there you are expecting Pyramids and Sphinxes, and the first and last thing you see in Egypt is a palace littered with statues of the elephant god Ganesh and Hindi dancing girls. I mentioned to an unnamed (of course) Cairo friend who was delighted to learn that his antics of smoking hash and listening to Metallica there has made it into the global guidebook. It still is a creepy, though absolutely striking, memorial. The Baron is now interred in the basilica. Nearby is Hosni’s House – aka home of the Egyptain president and dynasty builder, Hosni Mubarak. There’s also a swathe of military headquarters, which led to Heliopolis being bombed when Egypt was at war with Israel. Going back a little earlier, the elegant, old Amphitrion cafe was a drinking spot for Allied soldiers in both world wars and there are more than 4000 British Indian Army soldiers buried in the Heliopolis War Cemetery. 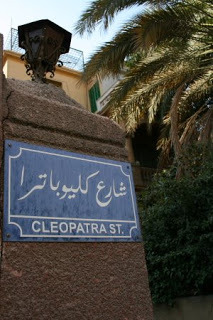 There are such cute streetnames as Cleopatra Street, some of the city’s most beautiful turn-of-the-century villas and still a few formal gardens, such as the one near my apartment, have not yet been built on top of. 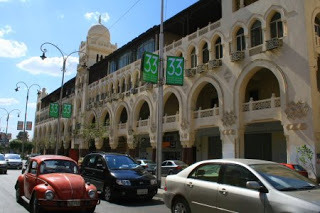 But the most striiking architecture is the row of white Moorish buildings along the chic Baghdad and Al-Ahram streets. Divine, many look like they’re ready for condemnation, human habitation indicated only by a rusting satellite dish. But Heliopolis is once again on the rise, with KFC, McDonalds and Pizza Hut built into these beautiful buildings’ ground floors, a flush of tiny, artisan handcraft shops dealing in jewellery, leather and antiques, and the sight of more than one beautifully kept balcony up on high, indicating the true wealth of the suburb. Last night was the fourth wedding or engagement I have attended (or inadvertently gate crashed) in the past fortnight. The first was while I popped into a hotel to pick up a friend, and we found ourselves embroiled an engagement zaffa in the foyer, sort of like a formal annoucement where the engaged couple walk down an aisle lined by friends and the traditional noisy, clashing band with handheld drums and wailing mizmars, a long horn, going full roar, with a bit of dancing and LOTS of camera phone action. The second was an engagement knees-up at the cool After Eight jazz club in Downtown, one of my favourite bars, but also one of Cairo’s smokiest. So we toasted the couple, danced to the house DJ’s bizarre music – which flipped from Supertramp to Arab pop to 50s rock-and-roll in three songs – and fell out onto the street gasping for fresh air after a few hours. 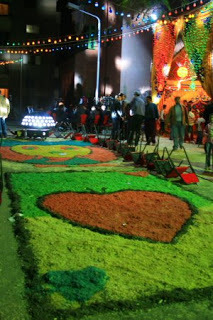 The third was a Libyan wedding. A seven-day affair, the bride was from a very, very rich family who decided to go the traditional Egyptian street wedding for one of the nights, where you erect a tent in the street and family and friends pour in to see the bride and groom on their white love seat and have a bit of a boogie. The couple were heralded by two men on fiery Arabian horses whose riders rode straight into the waiting crowd and through the long corridor archway of twinkling lights churning up the carefully created sawdust designed ‘welcome mat’ out the front of the tent. Inside, there was a brightly painted cart serving sham homous (the hot, spicy tomatoey, lemony drink with whole chick peas in it) rugs on the floor and round tables with white tablecloths and seats tied with sashes. I was in a shisha café the other night up the back of Sheraton Helipolis, in the north of the city. It was very chic and urbane, serving espresso and the fragrant, bubbling tobacco pipes. There was even a menu in Arabic and English. Firstly, there were the listings of what flavoured tobaccos they have, ranging from the most popular, the foul-smelling grape, to much nicer mint (think Alpine cigarettes), fruity peach, apricot and cherry, refreshing lemon and girly rose. Then, at the bottom of the list, was the item ‘Medical Layy’ for LE2 (60c). The layy is the long tube that curls up from the water pipe and to your mouth. Most cafes use disposable plastic mouth pieces to stop germs, but (and you can tell I was out with doctors at this café), the layy is a breeding ground for germs, and one of the most common ways that tuberculosis is transmitted in Egypt. We all got medical layys. Mine was even bambu (pink). Too cute. Received wisdom is that smoking a full pipe is the equivalent of knocking off a packet of cigarettes in one hit. It’s also common knowledge that photographing yourself smoking never looks great – the drawn-in cheeks and such. So no, I don’t have a decent pic. Here’s some dude I snapped in Midan Hussein, who’s pulling it off a whole lot better. 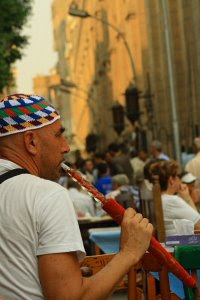 There is a career pattern in cafes, of which I was unaware, having met shisha boys with degrees, thanks to Egypt’s current economic situation – before the Global Economic Crisis there was the great Egyptian economic stuff-up, it appears. So anyway, cafe (ahwa) career paths: you start on the shisha, then move to the bar and finally as cashier. Just as well, because sucking smoke all day can’t be good for you in a country without worker’s compensation. 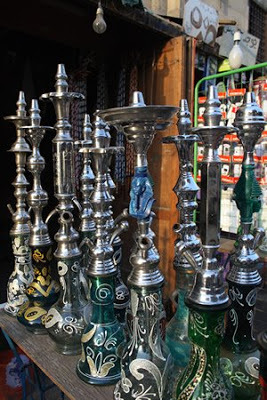 If you were going to be a shisha boy, setting up the water in the shisha pipes, balancing coals on the tobacco etc, then having a speech impediment that makes you slur the ‘sh’ sound is not advisable. Yet they’re out there. So the other night, I wanted (ayza) an apricot-flavoured (mishmash) shisha. “Ayza mismish shisha” I wanted to order from the guy. To which he would have had to reply, “La, mafeesh mishmish shisha.” No, there is no mishmish. Naughty, naughty, shouldn’t laugh. Going to hell. Oh yeah… I had lemon. So it’s the weekend, you’ve been out, had dinner, a maybe few drinks and then… not in the mood for a club? Why not ride a camel around the back of the Pyramids? What a great idea. People, I am serious. We’d been out, eaten, drinks, and then someone looked up into the sky. Full moon! Midnight! It’s time to go horseriding! So three cars of us flew out to Giza where stables line the fence around the Pyramids. Even though it was past midnight, the streets were full of young guys on horses, galloping – yes galloping – wildly up the tracks that lead out of the city and into the desert – a distance of less than a kilometer. 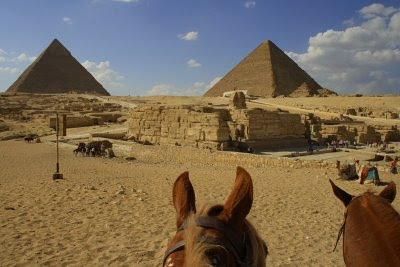 By daylight, this area is a tourist hub, with touts leading riders from across the globe out around the Pyramids and past the Sphinx on camels, horses and even a donkey or two. By night, the locals come out to play (at half the price), especially during the full moon, which clearly lights the sandy desert. We saddled up, my flighty grey mare pulling at the bit and skittering sideways when a band of about 15 boys flew past us. She spotted a few horses in a separate group in front of us and took off. Great. I was riding a leader, not a follower. There were just five of us riding, and we finally got into a cohesive group, turned a corner past a few shops and there it was – the desert sand and the pyramids in the full moon. We cantered easily for about 20 minutes to a hill lit with fires, where guys sold hot tea – no polystyrene cups, we were drinking from glassware, baby. As we rode through Giza yet more packs of boys (and a few squealing girls) on horses were heading out into the night, accompanied by at least one annoyingly loud quad bike and a dune-bashing car. We turned our horses into the stables, to see a final group of about seven saddling up, and bringing up the rear were two wild boys high up on a pair of camels, about to set out. I looked at my watch. It was 3am. Everyone loves a good windswept look – think Kate Winslet in Titanic. But on Saturday, it all got a bit ridiculous, with a fierce wind, the khamaseen, whipping across the city. This wind tears across the country from the west, hauling great quantities of dust and sand with it. It was said to have choked Napolean’s soldiers during their invasion of Egypt from 1798–1801, which you can believe if you heard the shutters and windows crashing during the night, when it howled like a banshee. I had left a window open, with the shutters closed, the night before, and the next morning, everything was coated in a thick layer of dust, which I’m still mopping up. According to Al-Alhram journalist Gamal Nkrumah’s column this week, the month of Mechir or Amshir, the sixth month of the Coptic calender,”invariably 8 February to 9 March, is the month of howling winds and sandstorms, which is why it is named after the ancient Egyptian god of winds, Mechir”. Cairenes have explained the weather as 10 days of cold and rain or howling winds, then 10 hot days when the clothes you wore yesterday are completely out of kilter, leaving you covered in either goosebumps or sweat. On the positive side, you can make a statement with big sunglasses, and there’s no need to use exfoliating face scrubs…just stick your head out the window. God love the Bangles for giving lazy journalists the phrase ‘walk like an Egyptian’. 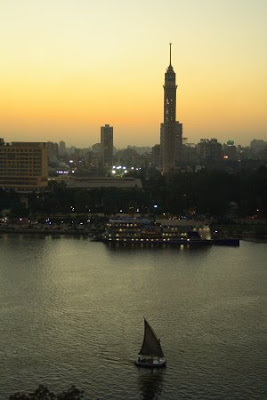 I’ve written about Cairo traffic before (http://www.theage.com.au/news/world/africa/curse-of-toot–and-karma/2008/09/04/1220121408026.html) and I thought that while I am now quite experienced – which means I don’t have to hold anyone’s hand (unless I really want to) to cross the road – I had a road-to-Damascus moment the other night when a small group of us were walking down my favourite street, the impossibly beautiful Sharia Al-Muizz in Gamaliyya. A taxi was squeezing through the narrow lane and past us, and tooted. “Habibi,” said Hany. “Why did you call the taxi ‘friend’ or ‘darling’?” I asked.He explained that when the taxi tooted at us, he tooted ta-taaa-ta, which means, ‘habibi’. I’d already heard the horns when people get married, the married couple drives through the streets followed by all their friends who joyously toot their horns in a victory sequence that’s also used after football matches by victorious fans. Ta.Ta. Ta-ta-taa. Ta.Ta. 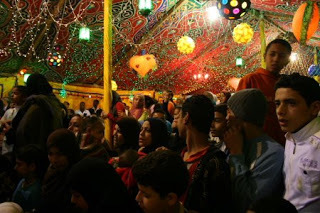 Ta-ta-taa (repeat ad nauseum).So, apart from having to learn Modern Standard Arabic, slang Egyptian and all the various hand signals, there is yet another language in this polyglot country – the language of the horn. Ta-taaa, ta! Ta-taaa, ta! Translates as “Bahebak bahebak, “I love you” (always tapped out twice) but weddings and niceties aside, then there’s also the darker side – trading insults on the freeway. Not content with shouting such pearls as “Shame on your beard!” (my favourite, and apparently QUITE an insult to a religiously observant man who grows his beard), there’s a sequence for, “Get out of the way, mother***,” which is then correctly responded to with, “Ok, son of a mother***.”)So there we were, tearing down the broad roads of Saleh Salem, alternatively loving and insulting ourselves, till other cars started to give us a wide berth as we made Hany tap out this wondrous new language on his car horn. As Rachael noted from the back seat, you’d get done for noise pollution in Australia.